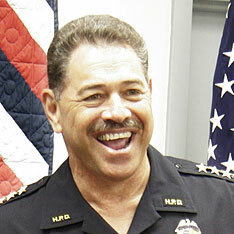 Police Chief Boisse Correa received top marks in the Honolulu Police Commission's annual performance evaluation, announced yesterday. Correa was rated on leadership qualities, managerial skills and communication with the commission. The commission cited the department's reduction of crime, response time and improved performance with technology as indicators of Correa's management priorities and progress. City work crews repaired a large crack in a sewer line yesterday near the intersection of Farrington Highway and Hakimo Road in Waianae. The break, caused by a sinkhole, was reported at about 11 a.m. Wednesday. The rupture was in a 20-inch force main, a pipe that moves waste water under pressure. Officials said that when the pump station started up, the sinkhole filled up. When the station was off, waste water appeared to flow back into the sewer line, officials said. The sinkhole was about the size of a Volkswagen Bug, officials said, and was about 30 yards from the ocean. Waste water did not appear to have entered the ocean, but warning signs were posted as a precaution and water samples were being taken, city officials said. Repairs to the sewer line were expected to be completed yesterday. Keeping Faith: Honpa Hongwanji Bishop Chikai Yosemori says Buddhist temples, like mainline Christian congregations, struggle to bring youthful members into their aging, declining population. The retiring leader of Hawaii's largest Buddhist denomination will continue work to lead younger generations in the religion's path to peace. Today: Meet the production designers charged with turning Hawaii locations into African kiosks, jungle cages, villages of yurts ... all for the ABC show "Lost." Also in the section, Lynn Johnston, who draws and writes the popular comic strip "For Better or for Worse," has decided it's time for semiretirement. What will this mean for the Patterson family whose adventures she has charted for 28 years? Business: A survivor of Cambodia's Killings Fields has woven the painful bits of her life into a successful retail silk business that has expanded from her home in Cambodia to Hawaii's shores. Travel: Las Vegas' swankiest hangouts are no longer just high-roller hideaways. Anyone with $10,000 to burn can find a suite to meet their fantasy. KULA, Maui » Fire investigators believe a forest fire that burned 1,700 to 1,800 acres in the Kula Forest Reserve was started by a discarded cigarette. Firefighters are still guarding the 16-mile perimeter around some 2,291 acres near Polipoli State Park on Haleakala and extinguishing hot spots. County firefighters were notified about the forest blaze Jan. 23, and more than 60 firefighters helped to contain it. Police arrested a 50-year-old man after he allegedly tried to rob a business with a rake. Police said that at about 10 a.m. Wednesday, the man entered the business, at Keeaumoku and Beretania streets, armed with a rake. He allegedly demanded money from the 63-year-old owner and threatened to kill him. The suspect then allegedly tried to hit the owner with the rake, but the owner blocked it with his left arm. A customer came in and the suspect left with no money, police said. The suspect later called the store and again threatened the owner's life, police said. He then returned to the store, and the owner called police. The suspect was arrested on suspicion of first-degree robbery and first-degree terroristic threatening. Police arrested a 25-year-old man who allegedly assaulted a police officer after he was caught in a stolen car. At about 3:10 p.m. Wednesday, an officer in Kahuku saw the suspect driving, police said. The officer knew the suspect did not have a license, and pulled him over for a traffic violation, police said. The suspect allegedly assaulted the officer before being restrained. The vehicle was later discovered to have been stolen. Police arrested the man for investigation of assault on a police officer. Police are asking for the public's help in finding a 20-year-old man for questioning in connection with the sexual assault Saturday of a teenage girl in Halawa. Police are looking for Julius A. Conley, who is known to frequent the Kahuku area. The teenage girl told police that two men, whom she knew, invited her to a get-together in Halawa where she was told she could see a friend of hers. Thinking she was going to meet the other girl, the teenager went to Halawa but instead was met by the two men, who kidnapped and sexually assaulted her for two days, said Sgt. Kim Buffett, Honolulu CrimeStoppers coordinator. After the two days, the men released her in Kaneohe, police said. The girl then filed a police report. Buffett said police have arrested one man for first-degree sexual assault and kidnapping. Conley is described as having a dark complexion, with brown eyes and black hair. Anyone with information on the whereabouts of Conley or this crime is asked to call CrimeStoppers at 955-8300 or *CRIME on a cell phone. Police arrested a 23-year-old man who was caught allegedly burglarizing a Waipahu home. At 5:47 p.m. Wednesday, a witness saw two men coming out of a house with property and then driving away. The vehicle was later located on Loaa Street in Waipahu, and the victim identified the items in the car. The witness arrived and identified the suspect as the driver, police said. The suspect was arrested on suspicion of first-degree burglary. Police were trying to identify the second suspect. Police arrested a 14-year-old boy for allegedly stealing an iPod from another boy in November. On Nov. 23 the boys were on a city bus in Ewa Beach when the suspect allegedly took the iPod from a 13-year-old boy's hand and refused to give it back. The victim reported it to school authorities Wednesday, and police arrested the boy for investigation of second-degree theft.